Rated PG: Contains a Kingly Voice. This episode of PodCastle is proudly sponsored by M.K. Hobson’s debut novel The Native Star. 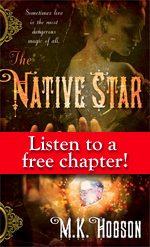 Read the Prologue and Chapter 1 online and listen to Chapter 2 now. Enjoy!